What are some of the best out there? I don't need anything too detailed, but would like something more than Google finance offers. Thanks for the help. 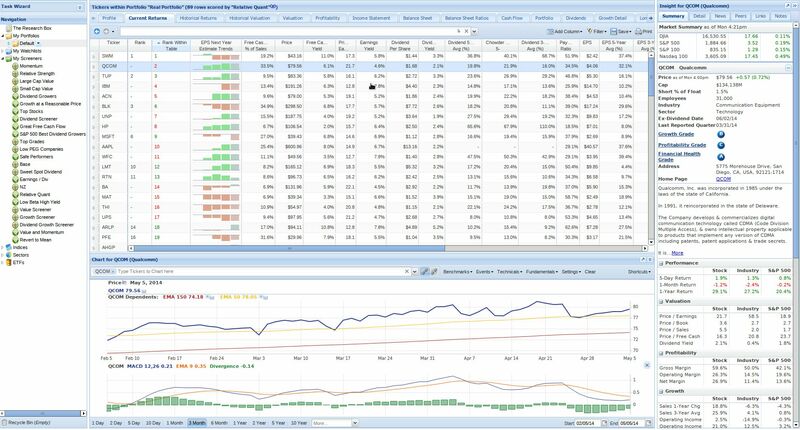 Since my accounts are at TDAmeritrade, I use their's although it lacks a couple metrics I am interested in, specifically current ratio and dividend growth rate. Also use Finviz (http://www.finviz.com) and sometimes Yahoo's. Some paid research firms' screeners are even better. F.A.S.T Graphs comes to mind but I don't subscribe right now. I would caution you about setting your criteria too tight. A good company may "miss" on one criteria but be a perfectly good addition to the portfolio. 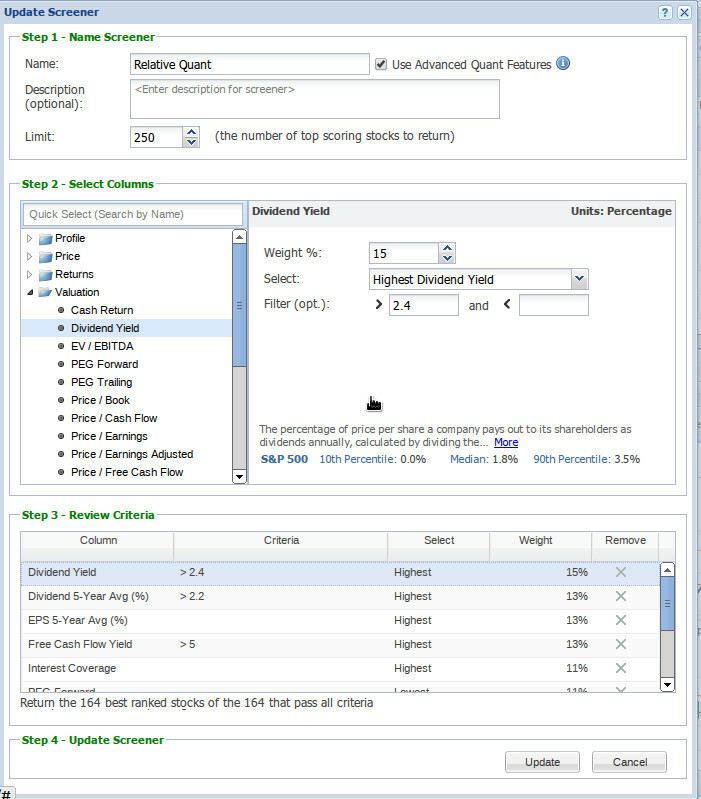 For example, if your requirement is a 3% yield you may miss something that has a 2.95% yield and the next dividend increase would put it well over 3%. Also, you may want to add something to your watch list for the same reason. Since I really like dividend growth companies, I also use the CCC list and sort and trim the 'All CCC' tab to narrow down my list. Also, screeners should only be a first step to come up with some candidates. Do some research once you've narrowed your list. They listen to their customers ( I've had a real, personal, human response for every feedback I've sent in ) and update the product a lot ... if you look closely at the first screenshot you can see a column for Chowder numbers. You can select Chowder columns based on 1 yr, 3 yr and 5 yr numbers I believe. That Chowder thing was a recent update and I believe was created directly from user feedback wanting that attribute to be screenable. Finally started experimenting and using Stock Rover and really like it (although the amount of data seems a bit overwhelming). Still havent experimented much with screeners, but really liking what I see so far. Same here! I signed up and tinkered for a few minutes and was pretty quickly overwhelmed. Looks like it will be a powerful tool when I can invest the time to get familiar with it. My application http://dividendgrowthforum.com/showthread.php?tid=1316 can help you screening Dave Fish list. The last version allows you to import it in just one click and define and store for later use flexible criterias based on Dave Fish information. Thanks for sharing Amos. Will try it out on the wknd. Anyone else having issues with Stock Rover since the last update? Edit: it's working fine now, signed out, cleared C&C, signed in again, it was all fine! No reason to panic! In my experience any time I've used the feedback button within the site to either report a suggestion or a problem a real human has gotten back to me with a legit response within an hour or two. I think it's a pretty small team in Boston.